The Cougars were flying high to open the 2014 season. BYU’s 4-0 start was highlighted by a 41-7 victory over Texas, but things changed for the worse during an early October contest against in-state rival Utah State. A 14-7 lead had become a 21-14 deficit when the season changed for the worst. Junior quarterback Taysom Hill went down with a leg injury during a second quarter carry and would not return for the remainder of the year. The Cougars would finish just 4-5 over their final nine games. After rushing for 1,344 yards and 10 touchdowns as a sophomore in 2013, Hill appeared to be making significant strides as a passer in 2013. Through the first five games, Hill was completing 67 percent of his passes and averaging a career-high 7.4 yards-per-attempt. Hill was the biggest piece to BYU’s offense in 2012 and had improved in 2013. Whether Hill can return to being the player he was prior to his injury could ultimately make or break the Cougars in 2014. 10 — That’s the number of consecutive bowls BYU has appeared in, but the Cougars open 2015 with a brutal September. BYU will visit Nebraska, UCLA and Michigan sandwiched around a home contest against a Boise State team that won the Fiesta Bowl last season. Five of BYU’s final eight games will be in Provo, but if the Cougars want to run their bowl streak to 11, they may need to find a way to pull an early upset. 75 — That’s where BYU ranked a season ago when it came to yards-per-carry. Much of the drop-off was due to the injury to Hill, but the Cougars averaged a full yard less per carry last season, with 4.2 as compared to 5.2 in 2013. BYU does return three of its top four receivers, but to manage a tough early season schedule, the Cougars will need to be able to run the ball. Why it Matters: The Sept. 12 contest with Boise State will be the only home game for BYU in a very difficult September. Fresh off a Fiesta Bowl victory, the Broncos have long been the measuring stick for all non-Power 5 conferences. If BYU hopes to turn heads nationally, this is a contest in which it will need to play well. Why it Matters: Coming off another nine-win season, the Bearcats appear to be BYU’s toughest opponent in October. After a brutal September, the Cougars should be favored in the two games coming in. This contest could ultimately decide whether or not BYU has momentum heading into the season’s final stretch. Why it Matters: With the Holy War temporarily defunct, the argument could be made that BYU was the worst team in Utah a season ago. The Aggies won 10 football games in 2014, and it was against Utah State that BYU’s season changed — Taysom Hill went down with a season-ending leg injury. The loss to Utah State started a downward spiral to close BYU’s regular season. The team lost five of its final nine games, including a loss to Memphis in the Miami Beach Bowl. 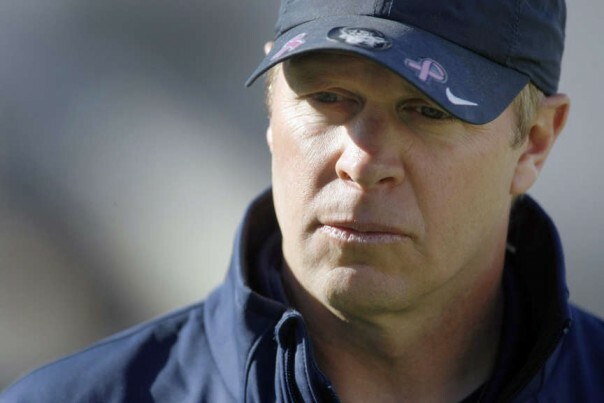 Will BYU head coach Bronco Mendenhall turn the corner with his team this season? Taysom Hill, QB – After rushing for over 1,300 yards in 2013, Taysom Hill appeared in just five games in 2014, but showed great improvement as a passer. Hill completed 67 percent of his passes last season for seven touchdowns. With his return to the lineup, BYU should be immensely improved on the ground, but if he can continue to made strides as a passer, the Cougars will be all the more dangerous. Mitch Mathews, WR – At 6’6”, Mitch Mathews is a big target for Hill and a threat across the middle. Mathews led the Cougars a season ago with 922 yards receiving and a team-high nine touchdown receptions. If Hill is able to develop as a passer, Mathews will be the biggest beneficiary and a tough cover for opposing defensive backs. Bronson Kaufusi, DE – An imposing figure at 6’7” and 265 pounds, Kaufusi returns for his senior year after leading the team with seven sacks and 11.5 tackles a year ago. Kaufusi should again serve as a disruptor along the defensive front. With a schedule that features a number of prolific offenses, Kaufusi will need to turn in another stellar season to give BYU an edge. Kai Nacua, S – A solid sophomore season for Kai Nacua ended in disappointment, as he was one of the players involved in the brawl at the end of the Miami Beach Bowl. Nevertheless, Nacua has put the incident behind him and is attempting to build on a season where he was tied for the team lead with a pair of interceptions. After coming on late last season, big things are expected out of Nacua for 2015. 5. Taysom Hill will rush for 1,000 yards. After a leg injury ended his 2014 season, questions surround how Hill will perform as a rusher in 2015. Leg injuries can be difficult to come back from, but a broken leg is a much easier recovery than a ligament tear. 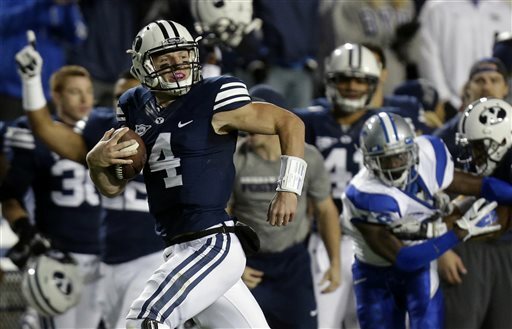 Hill will be the workhorse again for BYU and a very good one. 4. BYU will not go winless in September. The early schedule is brutal, but BYU has the talent to compete with the likes of Nebraska, Boise State, UCLA and Michigan. The Cougars defeated Texas a season ago and have always managed to hang with top-notch competition. Starting 0-4 is a very real possibility for BYU in 2015, but it will find a way to pull an upset somewhere. 3. The Cougars will struggle on defense. BYU was inconsistent defensively last season, holding four opponents to 10 points or fewer while allowing three others to hit the 40-point mark. The Cougars, however, lose their top three tacklers from last season and will rely on a number of young players. 2. BYU will notch a ninth straight winning season. The most daunting task for the Cougars will likely be surviving a brutal September, but every game from there on looks winnable, with a contest against Missouri in mid-November being the most difficult. Head coach Bronco Mendenhall maximizes his talent as well as any coach in the country. Don’t expect this year to be very different. 1. BYU will be the best team in Utah. The state of Utah may be one of the most underrated football states in the country, but that state this season will belong to the Cougars. BYU will have a chance to prove it on the field against Utah State to conclude the regular season, but the Cougars will also finish with a better record than Utah. The Utes won nine games a season ago, but they play in a very good Pac-12 conference and will have to travel to face Oregon, USC and Arizona. While the teams won’t have the opportunity to prove in-state supremacy on the field, the Cougars will have a better season in the standings when all is said and done.